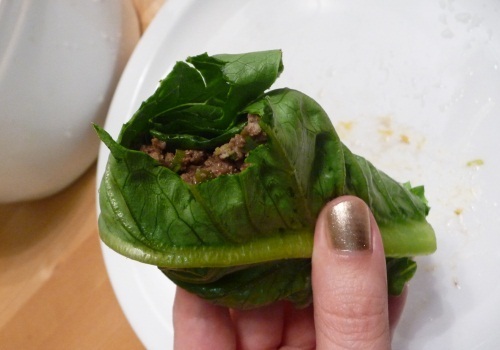 This is a current favorite dinner around here, spicy ground beef wrapped up in lettuce. I know I started with a recipe for these at one point, but I’m honestly not sure anymore where it came from anymore and it’s more of a loose outline than a recipe anyway. For two people, you start with a pound of ground beef. When it’s about halfway browned, I throw in a chopped jalapeno and a couple of minced garlic cloves. If I have a jar of Mrs. Kim’s Soy-Pickled Vegetables onhand, I’ll use a jalapeno and some garlic out of there. (It’s one of my favorite products I’ve discovered through my column, very spicy but with excellent flavor. Their kimchi is delicious too.) If the meat is giving off a lot of fat, spoon it off. If I have some leftover vegetables that I want to use up, this is where I’ll add them, finely chopped, to the pan. Once it’s browned, season with soy sauce, siracha, and a little bit of fish sauce, maybe a tiny bit of sesame oil, then simmer until most of the liquid is absorbed or evaporates. Turn off the heat and stir in the zest and juice of one lime, plus a handful of chopped cilantro. And that’s it. 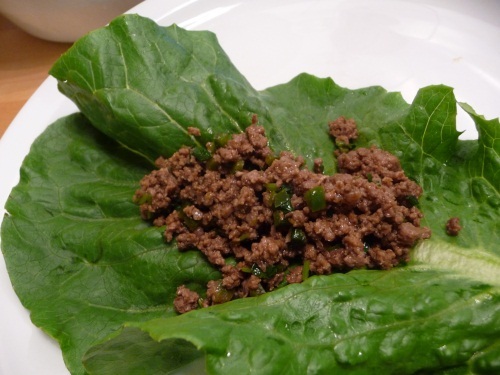 Divide the meat between two bowls and serve it alongside a bowl of crisp, cold lettuce, any kind that will hold its shape. I’m using romaine here, but iceberg or butter lettuce works too. If you use a small amount of meat per roll (two tablespoons, maybe? ), you end up eating roughly a salad’s worth of lettuce.